In 2017, Earth Overshoot Day—the estimated date when the planet’s annual supply of renewable natural resources has reached its carbon-absorbing capacity—was marked on August 2, earlier than in any year since the 1970s, when such recordings began. The relationship between humankind and nature comprises many different strands, and the pace with which the date has advanced suggests that some bonds may be broken beyond repair. In order to attempt to restore those that we still can, we must move to make reparations. Broken Nature: Design Takes on Human Survival prompts a shift in our thinking about the environment—here, treated intersectionally to include human and animal life at all scales, and economic, social, and political systems in addition to natural ecosystems. The XXII Triennale will further define the idea of restorative design and will gather examples new and old, from different domains and with different applications, in order to identify a new field of research and action. Under these circumstances, it is not enough anymore for designers to be politically and chemically correct. “Organic,” “green,” “environmental,” and “sustainable” are buzzwords that have been applied in earnest to design—including food and fashion—over the last two decades, as have the terms “ethical” and “aware.” Yet, despite these noble intentions toward humans, animals, plants, and places, we are still—as individuals and communities—tracking a course of destruction through overconsumption and disregard for countless forms of life, including our own. Designers can change flashy trends into more meaningful strategies imbued with agency by encouraging new behaviors using objects––from physical to digital items, speculative scenarios to functional tools, architectures to video games, and construction processes for new biological entities to old-school mending kits––as prompts and foils. Citizens of the world have as much responsibility as designers. Broken Nature thus demands us all to collectively apply our resources in order to constructively repair the damaged ecosystems that we inhabit and shape. The monitoring and reparation process will require concerted efforts by interdisciplinary and international teams, by companies, industries and governments, and at grassroots levels. In every case, design is a fundamental connective participant. Design can provide not only tactical creativity but also focus and strategy. The aim is to reconsider our relationship with nature beyond pious deference and inconclusive anxiety and instead move toward a more constructive sense of indebtedness to the environment. Among the reparation tools, Broken Nature will also consider experiments on social justice and new ways to generate mobility and economic development, relying on a fruitful collaboration among design, the life sciences, and the social sciences. In that sense, the broken bonds will include such fundamental connections and constructs as family, gender, race, class, and ideas of nationhood as much as pollution, material consumption, and global warming. The exhibition will also examine the role of new technologies. Broken Nature will thus enable us to contemplate the changed relationships that exist among designers, engineers, artists, scientist, and politicians. These various communities are not working in an isolated way and overlapping only when called upon––a Venn diagram of ad hoc committees––but rather they are continuously cross-pollinating and influencing one another. 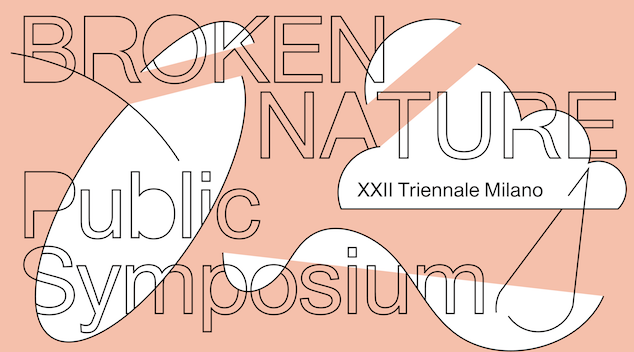 The XXII Triennale will be organized around an exhibition of several existing projects and six major commissioned experimental collaborations—among designers, engineers, and scientists. It will explore projects that commit to the idea of repairing and building connections, at all scales, in all dimensions, and from all fields of design research, from synthetic biology and biodesign to co-creation, and from environmentally responsible construction to self-assembly and beyond. The exhibition will underline design approaches aimed not only at correcting humanity’s self-destructive course, but also at replenishing our exchange with the natural context into which we were born.